EDITOR'S NOTE: Here we present a few recent stories and feature articles from a variety of sources that are related to the kinds of issues we cover on our web site and mission. They represent a small percentage of the information available to us, the public, as we fight to provide meaningful recovery services and help for those who suffered child abuse. We'll add to and update these pages regularly, bringing you just a few of the articles and resources available on the web site. Millions of years of evolution have gone into erecting the deepest of connections: that between mother and child. That primal bond—when forcibly shattered or disrupted—can be devastating for both parent and child, according to scientists, many of whom are weighing in on the White House's recent “zero-tolerance” policy designed to crack down on undocumented immigrants. Many other organizations, including the American Academy of Child and Adolescent Psychiatry, have released similar statements. On May 7, U.S. attorney general Jeff Sessions announced that the Department of Homeland Security would refer 100% of illegal immigrants crossing the border for criminal prosecution in federal court. Any minors accompanying them were to be taken into government custody. In the past, immigrants charged with this misdemeanor were able to stay in shelters with their children while waiting for further direction. The story is moving quickly. President Trump declared today that he plans to issue an executive order to end the separation of families at the border by indefinitely detaining parents and children together. Still, in a six-week period, nearly 2,000 children—some as young as 18 months old—were separated from their caregivers. 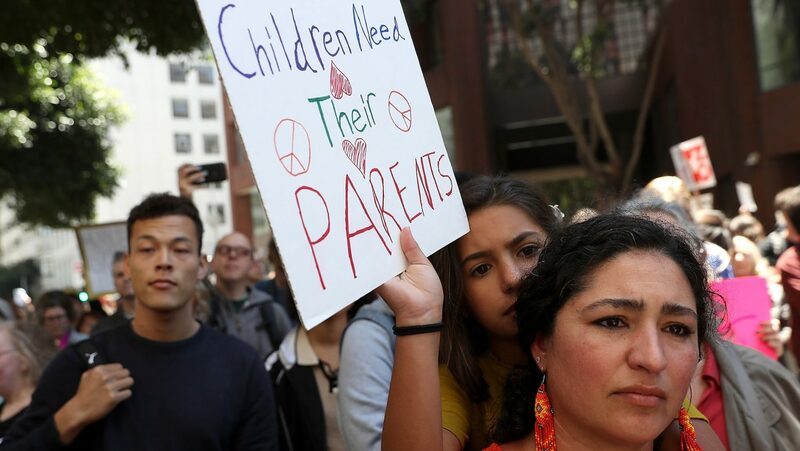 Yesterday, the Associated Press reported that babies and other young members of this group are living in “tender age” shelters in South Texas. “I would definitely consider [this] a traumatic experience with long-term consequences,” said Chandra Ghosh Ippen, associate director and dissemination director of the Child Trauma Research Program at the University of California, San Francisco and the Earth Trauma Treatment Network. When a child is separated from his or her parents under chaotic circumstances, a monsoon of stress hormones (like cortisol) floods the brain and the body. These hormones are important for navigating stress in the short-term. However, in high doses, these chemicals—if hyperactive for a prolonged period of time—can increase the risk of lasting, destructive complications like heart disease, diabetes, and even some forms of cancer. In addition, multiples instances of trauma early in life can lead to mental health problems like depression, anxiety, and post-traumatic stress disorder (PTSD). On top of this immediate biological response to separation is the frightening experience of watching a caregiver undergo severe emotional upheaval. The conditions under which these undocumented minors are now living are varied and unclear, but ProPublica obtained audio suggesting that the children are under duress. “It sounds like, from what we're hearing, that there aren't people there to help console them and help them self-soothe, which would be something that would be really key to help offset those biological responses [to stress],” said Erin C. Dunn, a social and psychiatric epidemiologist at Massachusetts General Hospital's Center for Genomic Medicine. The situation is a case study in what psychologists call “attachment,” and it's the reason why children who are separated from their primary caregivers desperately need replacement care. Berlin says that many rigorous research projects since Bowlby's original writings have demonstrated that these ideas make sense; in other words, empirical evidence has confirmed his theory, as well as how a child's future development is based on these patterns formed early on. “Even when children are in the care of parents who may not be able to meet their needs or to keep them safe, they still organize their behaviors and thinking around these relationships and go at great lengths to maintain them,” said Carmen Rosa Noroña, Child Trauma Clinical Services and Training Lead of Boston Medical Center's Child Witness to Violence Project. Moreover, when these attachment relationships are suddenly subverted and there is no other adult who can help the child make meaning—or a story—of what has happened, the child might experience not only a sense of confusion and terror but might also blame himself or herself for losing the parent. “All they know is that the people who were there to protect them and help with every little thing are no longer there,” Berlin said. Parents, of course, face similar trauma. Especially in Latin America, the concept of motherhood is heavily linked to the idea of the self-sacrificing woman. “[That identity] permeates across the countries in Latin America,” said Gabrielle Oliveira, an assistant professor at the Lynch School of Education at Boston College and an expert on the concept of “transnational motherhood,” or the notion that women can engage in the care of their children across borders. Oliveira says that women who decide to migrate with their children to a new country usually view it as a safer option for the whole family than staying put. Dunn says that what has happened is especially scary because evidence suggests that the effects of stress and trauma vary based on the age of the child—the youngest children may be the most vulnerable. “It's a form of systemic violence, and it's becoming normalized,” she said. This article was edited on June 21, 2018, for clarity.